Manhattan’s most expensive condo building is attracting celebrities and the Wall St. elite. The ceiling on prices for prime Manhattan real estate seems to keep getting higher. If you’re willing to pay over $7000 per square foot, you might be able to move into 15 Central Park West, which, according to a CityRealty report released on Tuesday August 22nd, remains the most expensive condo in New York City. In the last twelve months eight sales with an average square foot price of $7227 were inside this building, which was completed in 2008. The penthouse in the property exchanged hands in the last year for $50.55 million which worked out to be an eye watering $9,581 per square foot — the most expensive sale of the year by unit price. Central Park is big and there are a lot of properties around it, particularly on Billionaire’s Row near 57th St., so why this one? An important factor seems to be designer, Robert A.M. Stern and developers the Zeckendorf family’s, decision to root this building in the sprit of classic New York. They eschewed the glass and steel skyscrapers going up around them in favor of a limestone exterior, taken from the same Indiana quarry used for the Empire State Building. Before the building was complete it had A-list celebs like Sting and Denzel Washington buying apartments which only increased the buzz. Joining them were Wall Street heavy hitters like hedge fund manager Daniel Loeb, and former Citycorp CEO Sandy Weill who paid $45 million and $44 million respectively for their residences. No amount of glossy magazine ads and shimmering online videos could buy that kind of publicity. The Central Park area still seems to be the biggest lure for condo owners able to splash significant sums of cash. The second and third most expensive condos, according to the report are 432 Park Avenue (45 sales with an average of $5,930 per square foot) and Residences at the Mandarin Oriental at 80 Columbus Circle (four sales averaging $5,215 per square-foot). In fact, the most expensive sale of the year was at 432 Park Avenue — $65.7 million for an 85th-floor condo. Another condo in the same building on the 83rd floor followed closely behind selling for $65.2 million. The Rafael Viñoly designed building rises 1,396 feet above Park Avenue between 56th and 57th Streets, making it the tallest residential tower in the Western Hemisphere. The stratospheric prices received for its upper floors (a 95th floor penthouse is currently available for $82 million) will also encourage other super tall condos under construction in the area such as 53 W53rd St (1050 feet) that it could enjoy similar success despite fears about a downturn in the luxury market. According to NYCurbed.com the property has consistently been ranked No. 1 since 2014 in the City Realty 100, a bi-annual index tracking the performances of top 100 condo buildings in New York. Following the lead of 15 Central Park West, other Robert A.M. Stern designed new constructions are also rekindling classic New York and going all limestone instead of glass and steel. The Related Company’s 70 Vestry in Tribeca is one. It’s average price per square foot is $4,526, according to AG filings. 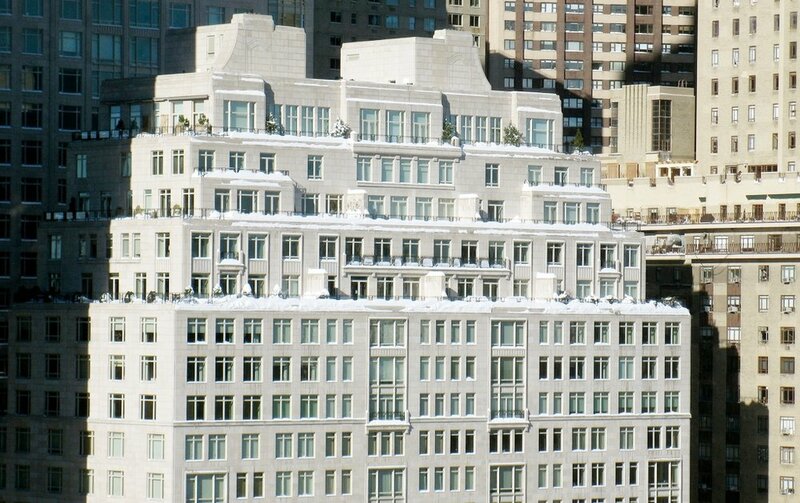 The Four Seasons Private Residences, 30 Park Place completed last year, is another. It has a an average price per square foot of$3,587 according to City Realty. Limestone or any stone facade doesn’t come cheap however, amajor detriment to developers, wary of building costs. Glass can be fabricated in factories and brought on-site for installation, whereas traditional buildings, such as brick, require labor by hand on site. Limestone not only cannot be manufactured in factories, it has to first be quarried. Thus the cost per square foot is handed down to the buyer. Proponents of glass and steel construction will point to the added light, thinner walls and thus greater usable square feet. Its critics will point to the detrimental effects of prolonged sunlight on furnishings and greater heating and cooling costs. Old New York lives on.